The Protest Selfie is one of the most common means of identifying with a movement today. The Protest Selfie is the easiest coupling of text or image with one individual; this is how we tell our network, “This is me, and I am for this.” While a selfie is usually understood as a photo taken by the subject of their face, the protest selfie lets ideology compliment if not entirely replace the face. We upload these images using webcams when we can’t make the protest, with our cellphones as we march and chant, or Photoshop them entirely. This simple and powerful gesture marries that individual with a movement much larger than herself. Where did the protest selfie come from, and how has it changed in the networked world? If you stumble across a protest for a movement of which you are not particularly familiar, you’re likely to begin reading the protest signs and looking at the people involved. Questions arise as you curiously scan the crowd. Are the protesters sincere? Is their cause something you identify with or not? Do you identify with them? A public rally hopes that you do, and that in turn you decide to act in a way more in line with their goals. While movements want to be understood as groups, people often relate to them on an individual basis. The signs and the people are all important representatives of a movement – the protest selfie is a convergence of the two. What is a Protest Selfie? We might define a protest selfie as a networked version of the interplay of identity and a political message. This is strongly evidenced in the hashtag meme #IAmTrayvonMartin. #IAmTrayvonMartin is very different; there is only one Trayvon Martin, and using his name as a means for protest is highly problematic. However, the method of identification and sign are quite similar, while their distribution, creation, and evolution are very different. The Protest Selfie is ubiquitous and lends itself to evolutions. #IAmTrayvonMartin was accompanied also by #HoodiesUp, #StandWithTrayvon, blacked out profile pictures, profile pictures with the user wearing a hoodie, and even just a picture of a black hoodie. The anger around the Trayvon Martin case was shared in a plethora of different protest selfies, while all pointing toward that anger. In this way, the protest selfie differs dramatically from other selfies in that the individual can be almost entirely replaced by the message. Although the protest selfie is a result of and participation with the networked world we live in, what is most exciting is its potential to reach so many people on an individual basis. While the news has covered protest movements since news began, it was almost entirely done in one direction where images and information were broadcast from a few news anchors and journalists, with biases and channel limitations, to a large audience. Now, the social web lets us do our own reporting and especially curation of news. We broadcast our own politics to individuals and they can speak back. Who hasn’t been involved in a debate online with the most unlikely group of our disparate friends? While these debates can of course result in idiotic flame wars, and often do, there is a really exciting potential in these interactions. We usually keep walking when we see a stranger carrying a sign we disagree with on the street. But a post you disagree with from a classmate from six years ago? A comment on Reddit? Let the debates begin. The protest selfie in flesh space and online have different audiences and potentials, and rarely take place in a vacuum void of the other. The equality profile picture meme. 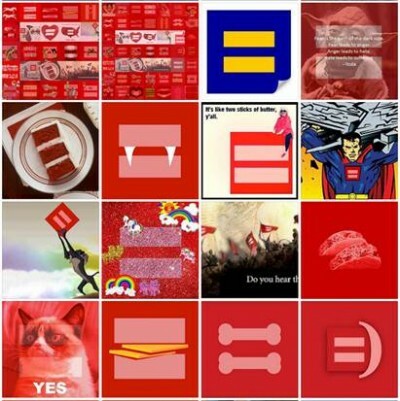 The Human Rights Campaign Facebook Equality Meme is one of the most successful Protest Selfies in history, with literally millions of participants. People have argued that this type of protest selfie only amounts to slacktivism, and dismissively say that if changing profile pictures was the only thing a movement was capable of, it probably wouldn’t change much. Yet many of us have come to invest so much time and energy into our online avatars that they are a very real facet of our identity; coupling a message to your name online is a similar statement as doing so in physical space. While these protest selfies are merely the lowest threshold of involvement in a movement, successful movements are strengthened by welcoming involvement at any level. The movement must have all the levels of engagement to be successful, so scoffing at a profile change can be myopic if it ignores the other parts of the movement. With so many remixes in the equality meme, the protest selfie is fantastic at allowing people to get involved in their own unique way. For many movements, the more activity and involvement the better, both offline or on. People snapping protest selfies and posting them online spreads awareness and makes protesting more welcoming – no easy task when arrests and pepper spray are a real threat. Showing up in person and spreading news of your involvement online through protest selfies puts your body as well as your avatar in line with the cause in a way one or the other couldn’t. Yet building online social movements in more controlled internets as in China, Iran, and Azerbaijan can be a difficult task; can trust in a social movement be built anonymously online? While Facebook’s founder Mark Zuckerberg believes it to be an impossibility, the importance of anonymity can be easily lost on privileged westerners who have benefited greatly from a relative freedom. 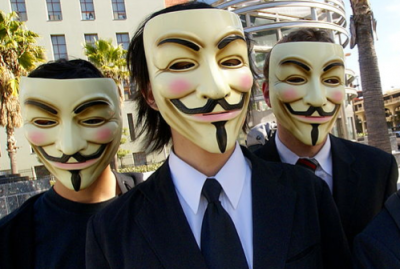 While allowing for anonymous speech online is something I see as a human right that should be fought for, the power of the protest selfie with an identifiable individual is indisputable. By not publicizing their own name, they could feel like they could say whatever they like. It would be difficult for officials to track them down. Mr. Ai’s stance is that if no one takes responsibility for what they’re saying, then there’s really no one taking a stance against the oppression that is happening. I think that was why he came up with the activity. The free Chen Guangcheng meme. The movement to free Chen Guangcheng and the protest selfie meme that went with it has some really fascinating aspects of the protest selfie unique to China. As a protest selfie in a surveilled and censored network, the Free Chen Guangcheng meme needed to be able to slip past Chinese censors to spread. And as a movement around one individual, the selfie materialized as a blurring between the poster of the selfie with Chen Guangcheng. Thus, thousands of Chinese netizens began posting images of themselves wearing sunglasses as a gesture of solidarity subtle enough to evade censors. Anonymous at a protest in Los Angeles in 2008. Finding means of building and sustaining trust and interest while we are increasingly overwhelmed with images and movements will continue to be every budding social movements’ big struggle. But with the ubiquity of networked culture, will the protest selfie remain as strong? The ever growing celebration of the internet’s “hive mind” as seen in Anonymous, crowdsourcing, Wikipedia, Github, and more loosely in Occupy and the Arab Spring remains likely. Is this ideology incompatible with the protest selfie, or a representation of it? While anonymous group action is growing online, we still mostly become aware of these groups and movements through individuals in our network. Our desire to place a face with a cause, whether good or bad, runs very deep. Even still, we are seeing that desire weaken in Anonymous and its offspring, as we become more accepting of avatars in lieu of face and legal name identities. We are learning how to trust anonymous strangers online for a cause, and in turn how to be understood only as a part of a larger group. Infamous sign from Occupy Wall Street. We see in Occupy and Lulzsec a fierce resistance to traditional branding tactics considered imperative to past movements. Occupy said that the entire system was at fault; only a mass movement with direct democracy and action was going to change our circumstances, so choosing one message was to admit defeat. Yet the protest selfie remained just as popular. Individuals still participated with their own opinions and motivations, but the movement never adopted their messaging as its own. While the individual remains vital and positioned at the epicenter of their network, they have begun to understand themselves as of the movement. 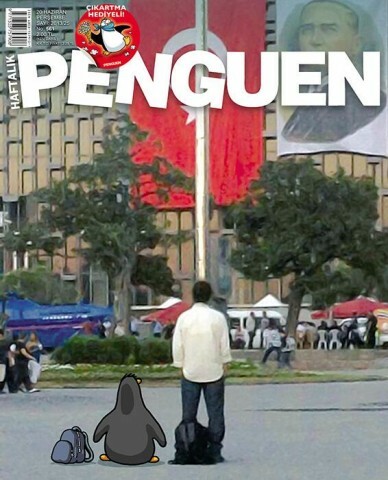 Standing Man meme from Turkey. In a similar way to much of the messaging of Occupy in the USA, the Standing Man protest in Turkey and its subsequent memes took a defiant if unclear stance against the state. Although the battle over Taksim Gezi Park was sparked by a brutal fight over the demolition of trees in the park, the social movement quickly expanded to a palpable albeit generalized discontent about the government writ large. This feeling was perhaps best embodied in the Standing Man protest, silently and defiantly standing in opposition. Who were these individuals and what were their personal rationales for standing there? Creating vibrant and diverse communities for real discussion and where these selfies have meaning is no easy task. Many netizens have confused our corporate platforms with the traditional idea of public space. Although Facebook, Reddit, 4Chan, and so on, have many similarities to public squares, we aren’t fully aware of the inner-workings or motivations of these private platforms, and confusing them with public space is dangerous. This was made all too palpable after the Snowden leaks when we discovered many of the online companies we use on a daily basis were complicit in our surveillance. Our social media platforms are guiding us in many ways. People like Eli Pariser worry a great deal about how personalization of the internet creates information bubbles on Facebook and Google, which subtly decide who we interact with and what we read. Moreover, Ethan Zuckerman writes extensively about how the internet actually hasn’t made us as connected as we thought – we talk to very similar people online as we did offline. If Zuckerman and Pariser are right, the networked protest selfie may be less effective than we might believe. But the protest selfie continues to fulfill a deep desire for a 1 to 1 connection to build trust and identification with a movement. The speed of communication for organizing, spreading awareness, and the ability to foster exciting new relationships are growing, and the protest selfie is one way in which social movements are keeping up. It allows people to participate even if they couldn’t show up physically or are showing up anonymously; it says that they are there, standing in solidarity, online and off.